Because of the nature of SCP-xxxx containment is impossible. All public information pertaining to SCP-xxxx is to be removed as soon as it is found. Sagittarius" has been established to ensure information on SCP-xxxx does not get into the hands of the public eye. In the case that procedure "45 Sagittarius" fails, The Foundation is to immediately prepare for an "IK-class collapse-of-global-civilization" scenario. 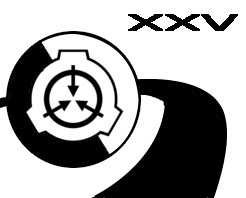 The Foundation has made dealings with multiple world governments to use widespread amnestics in order to maintain control, and cover stories of worldwide conflict are to be put in place in order to prevent knowledge of SCP-xxxx to spread further. If any FTL vessels belonging to any GOI's are to travel to The Gloria Dei I system they are to be interdicted and terminated by on station Foundation fighters and frigates in the system. In the case of survivors, they are to be detained and indefinitely kept imprisoned on Gloria Dei 6d, there they will be interrogated for any useful information. SCP-xxxx is an anomaly in space-time where strung together between the supermassive black holes at the center of both The Milky Way Galaxy and The Andromeda Galaxy, is what appears to be a string, ████ meters in diameter, weighing an estimated █████████ █████, spanning two point five (2.5) million light years across hitting the event horizons of both black holes. Because both ends of the string are being pulled in by both super-massive black holes, both galaxys are being gravitationally attracted towards each other at one hundred ten (110) kilometers per second. Originally it was believed that natural gravitational forces were the cause of the two (2) galaxies to move towards each other. The origin of the string is not known, but what is known is that at one point or another the two ends of the string were caught between both galaxys and began pulling them in at each other. It is speculated that the Milky Way Galaxy and Andromeda Galaxy were originally on two separate paths were they would not collide with each other and pass without incident. From observations of the Hubble, Spitzer, Webber and Sagan space telescopes, it is known that other galaxys within the observable Universe are on similar collision courses with each other. The Foundation has not ruled out the possibility that other instances of SCP-xxxx could exist in the Universe. At the current rate of velocity, it is estimated that both Galaxys will collide in four (4) billion years. Current models highly suggest the collision of both Galaxys could cause cataclysmic destruction of all involved objects in it's wake, instead of everything having little to no chance of hitting each other as originally thought. 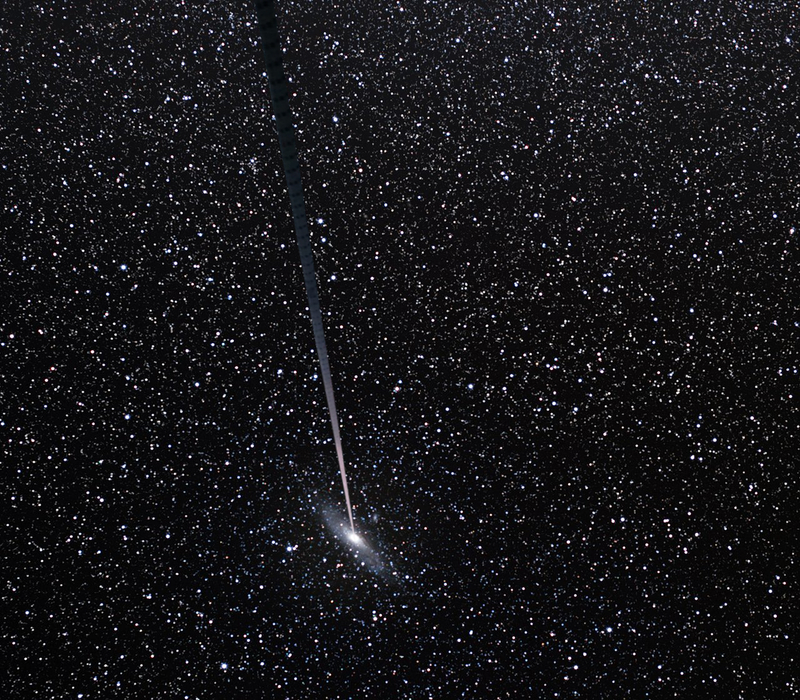 Knowledge of our Galaxy and Andromeda colliding with one another is speculated to have dangerous effects on modern society and it is speculated that if information of SCP-xxxx is discovered, global breakdown could follow. Cults, war, famine, (etc.) could erupt from an information breach. Total collapse of civilization has also not been ruled out as a possible scenario. As such knowledge of the two galaxys colliding has been censored from public view. The Foundation has begun an initiative to purge the existence of Andromeda and the Milky Way from the public eye, by cooperation with airline companies, special chemicals have been added to the wind trails left by commercial airliners to dim the night sky to a point where the Milky Way and Andromeda Galaxys cannot be observed unless in an extremely low light region. As of 2035, licences are now required to own any astronomical equipment under "the potential danger of damaging eyesight from looking at the sun". The foundation has now also run campaigns promoting the discouragement of the observation of space. This purging of knowledge pertaining to the existence of The Milky Way and Andromeda has worked considerably, and has given a noticeable 78% drop in public interest pertaining to space travel and the subject of astronomy. On May 23rd 2015, Foundation astronomers were observing regions of space near Sagittarius A when a star made what appeared to be a gravitational slingshot around an empty region of space. thought to be a black hole at first, it was quickly deduced not to be one, as no Hawking Radiation was visible from the region of space where the slingshot occurred. The region of space sparked more interest for Foundation astronomers until more stars were seen slingshoting empty regions of space without any signs of black holes. When it was discovered that all the slingshot stars were in areas that pointed in a direct line towards the Andromeda Galaxy, resarchers began looking for a spot that could be used for potential close observation of the anomaly. On August 24th 2022 a binary Star system 2324 light years away from Sol was seen to be affected by the "gravitational line" and from the gravitational forces of Star B, Star A was seen to be orbiting around an empty region of space as Star B was shot out of orbit from it's twin. Further observation over time showed that 6 exoplanets were in heavily augmented orbits around the star. With a target in sight the Foundation astronomy team made a joint decision to launch a peregrine mission to the star system. By a near 7 to 6 vote, the 05 council approved for the launch for the Peregrine 25 mission to the star orbiting the anomaly; the star now called "Gloria Dei" as of 2035. Construction on the Peregrine 25 rocket was completed on April 12th 2023 through NASA, under the guise of a resupply mission to the International Space Station. 36 hours after launch, the crew docked with the S.C.P.S - Merrill. The following is a transcript from the crew of peregrine 25 before activation of the temporal sinks used for FTL speeds. FLIGHT RECORDING NOW IN SESSION. *The sound of oxygen venting in can be heard as the ship cameras start activating one by one. The three astronauts are visible on the main bridge. VENTING COMPLETE - OXYGEN LEVELS AT 100%. THE MERRILL IS READY FOR DEPLOYMENT. Alright, that's that. It will take about 5 hours for the temporal sinks to charge for the jump. Given that the object is 2324 light years away, the mission is projected at taking 6 years to get from here to there. 6 years huh? You gonna miss anybody? Is anyone gonna miss you? My parents will miss me, i'm sure. I just don't know that they will know their son is headed towards one of the most massive anomalies ever discovered by man. What do they think is lying out there that's important enough for someone like us to check out? Unless their equipment failed on 28 separate occasions when they viewed this "thing", it appears to be a seemingly empty region of space that shoots in a line to Andromeda. when visible objects intersect with it, they either slingshot around it or disappear, never to be seen again. You think it might be something like what ████████████ found? No they believe it's something… more. Far bigger than anything else humanity has seen thusfar. We're gonna need to eat before we stow away for the next half decade. Let's go over to the grav-ring and eat before we freeze our butts off. The footage shows them getting out of their chairs and floating freely to the mid-section of the ship. They then go down into a tubular structure which leads into the ship's artificial gravity wing. They take food that is ejected from the ship's automatic microwave refrigerator spend the next 30 minutes eating and discussing the mission protocols in case anything goes wrong. After they finish they head to the cryo-section of the gravity ring and start the tubes. Any last words before we head off into the void? That's one small step for man, and one giant leap for my stomach. Ate too much big guy? It' doesn't matter. we have 15 minutes before we need to get in those tubes before those men in black puppeting Houston start getting antsy torwards us. Who do you suppose those guys were anyway? They we behind the cameraman the press sent, the launchpad before we took off, mission control, and I could have sworn that I saw one pocket a firearm before he went back to whatever shady place he came from. All I know is that they're higher ups from the U.S. government who are supposedly funding this OP. They probably work for some committee that is concerned about whatever this thing is. The Illuminati? Secret saviors of humanity? Because I know that you know way more about these guys that we do Orville. I told you what I know Alex, they funded us and they want us to bring back good results. Alright! No need to be snappy. I'm the Commander after all, it's my job to ask of my crew. Well, i'm up for some shut eye. Good night! Good night Mark. You too Alex. Alex says nothing as the tubes fill with the cryogel as they slowly freeze into place and stop moving. Contact with the Merrill was lost, and all that was possible was the monitoring of ship systems. 6 years and 2 months would pass until contact would be re-established. The following is a transcript of the crew logs 15 minutes after arrival.